If I say that we are living in an Electric vehicles era, it will not be wrong. As electric ways of transportation are becoming common on the roads, from a Toyota Prius for a groundbreaking Tesla. A new addition to this huge category is the Cake Kalk. If you are interested in spending money on the minimal, stylish, off-road machine, the best option for you is the Kalk dirt bike released in 2018. No fuel consumption means no more burden on you. The battery-powered electric bike is 100% eco-friendly. It is just another attempt to preserve the remaining fossil fuel to keep the air fresh and clean. When dirt bikes came to market, the major complaint from customers was about the style and shape of these bikes. Often times, bulky and large batteries didn’t fit for comfortable riding. As time passed, the designers launched sleek, lightweight, and compact electric bike. The Kalk off-road motorcycle is one of those. Cake’s founder and Chief Executive Officer Stefan Ytterborn, is also the founder of the POC helmet brand. He was also a brand designer and marketer at Ikea. That’s why his experience is prominent in designing and making the Cake Kalk. The name of the bike is derived from a Swedish term limestone or Kalksten. It’s a Gotland bedrock. The white bedrock gives special light to Gotland. In the same way, the white KALK is designed for rollers, bunks, curves, and jumps. As a new manufacturing brand of electric transportation, the “Cake” has the mission to start a journey with a zero-emission for ultimate fun and excitement. The very first product of Cake is a Kalk electric motorcycle. This off-road bike blurs the difference between motorcycles and mountain bikes. As a perfect light electric motorbike, the Cake bike becomes the best companion for hiking, camping, and backpacking. Because, while designing this super-fast bike, the manufacturers have the aim to combine off-road performance, simplicity, and weight into one. For fuel bikes, everyone deals with greasy lubricants and change messy oils time to time to maintain the condition of the bike. They also become conscious of filling the gas tank. All these upkeep steps not only create extra chores but are costly too. On the other hand, dirt bike like the Cake Kalk eliminates the hassle and mess completely. Moreover, the battery takes only one and a half hours for 80% charging. There are three different modes to check the life of the battery. The first mode is explore; in this mode, the bike runs at the speed of 45 km/h and the battery life for this mode is two hours and more. The second mode is Excite; the perfect mode of trail riding and the riding time for this mode is 1 to 2 hours. The third and the last mode is Excel. This mode is for the race and rider rides at high speed and maximum torque, so, battery life is reduced to one hour. The IPM motor of CAKE KALK electric-bike is manufactured in Europe. This 16 hp or 15kW motor gets power from 18650 cells of the lithium-ion battery. Other specs of the battery include; 50Ah, 51.8 volts, and 2.6 kWh. Some people think that if they get a battery powered bike, they will have to sacrifice the speed. They all are wrong at this point. Because the Cake KALK, a high-performance, and an electric off-road motorcycle allow its rider to discover and explore the world at 80km/h or 50 miles per hour with one-time battery charging. Influenced by enduro mountain bikes and downhill, the founder of Kalk electric off-roader focused on handling, components, suspension, and unique frame geometry. Expect these points, the company combined expertise from electrical engineering and off-road motorbikes industry. That’s why there are no gears and clutch. With excellent performance, this KALK bike has 150 pounds (68kg) weight. This weight is very light as compared to other off-road bikes with 250 pounds (113kg). So, whatever the riding position or place, a rider can handle it easily. The front hub of Cake e-bike is Computer Numerical Control machined from the strong 7075 aircraft aluminum, using pure stainless steel cartridge bearings and 15-mm axle. Except for functional designing, it is perfect for 32-pull spokes and works well with Cake KLAK rotor discs. The rear hub is also CNC machined and crafted from the same 7075 aircraft aluminum using SKF stainless steel cartridge bearings and 15-mm axle. With 32-straight pull spokes, it is also attached to rotor discs. The tires of Cake are of trail savers brand. They are specially designed with minimum fear of tear and leave less footprint during riding. For torque support, the tires are fit to 24-inch rims. Moreover, the whole design of Kalk e-motorbike wheels is similar to MTB wheels for easy replacement. The 3.25 narrow tires reduce rolling resistance and maintain balance and never hurt the battery life. Front and back wheels are fully spoked and hand built. There are total 32-pull spokes in each wheel. For maximum support, the rotors discs are designed in unique shape. Professionals use laser cut technology to craft rotors from stainless steel. The diameter of rotor discs is 220mm and the thickness is 3.2mm. Like other parts of the e-bike, the stem is made of 7075 aircraft aluminum by using CNC machine technology to make it fit the Öhlins triple clamp. It is 15mm high, 60mm long, and uses for 31.8mm bars. Fully tested, the handlebar has 31.8mm diameter, 20mm high, and 800mm wide. Like all other components, this handlebar is made of super strong 7050 aircraft aluminum. The tires, sprockets, hubs, and axles of the Cake Bike are tested by experts. The axles are 25mm with a trademark of 7075 Power hubs. The company price of CAKE KALK is $14000, which is more than other traditional off-road bikes. But if we consider the specifications and the mission of zero-emission society, this price seems perfect. Moreover, this bike has some great features of past e-motorcycles like Alta Motors and some others. If you want to get the lower priced electric bike you can visit eBay. Electronic information engineering. Electric Bike Lover. 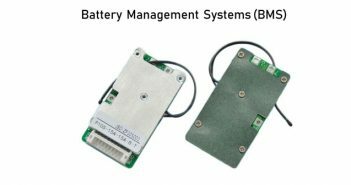 What is the lithium-ion batttery BMS-Battery Management System? What is the aim of the BMS? What are the functions of the BMS? How to diagnose the lithium battery BMS damaged or the battery cells damaged? Spread useful and valuable knowledge and news about the electric bike, electric skateboard, and the electric scooter.